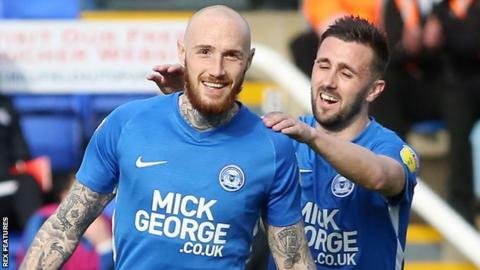 Peterborough revived their stuttering play-off push with a comfortable home win against struggling Southend. Toothless Southend remained above the relegation zone on goal difference after an 11th match without a win. Posh should have taken the lead after just six minutes when Ivan Toney twice had headers saved by Southend goalkeeper Mark Oxley. After the first save, the ball looped onto the crossbar with Shrimpers defender Elvis Bwomono just managing to clear the rebound ahead of White. Both goals came from Maddison free-kicks 35 yards out. The first in the 41st minute flew over the wall and into the net, while the second after 58 minutes bounced in front of Oxley, who could only parry it into the air and White was on hand to head in. Match ends, Peterborough United 2, Southend United 0. Second Half ends, Peterborough United 2, Southend United 0. Foul by Rob Kiernan (Southend United). Attempt missed. Matt Godden (Peterborough United) right footed shot from the left side of the box is close, but misses the top right corner. Substitution, Peterborough United. Kyle Dempsey replaces Marcus Maddison. Ivan Toney (Peterborough United) wins a free kick on the left wing. Ivan Toney (Peterborough United) is shown the yellow card for a bad foul. Timothee Dieng (Southend United) wins a free kick on the left wing. Substitution, Southend United. Isaac Hutchinson replaces Michael Kightly. Attempt missed. Timothee Dieng (Southend United) right footed shot from outside the box is close, but misses to the left. Harry Bunn (Southend United) wins a free kick on the left wing. Substitution, Peterborough United. Siriki Dembélé replaces Lee Tomlin. Substitution, Peterborough United. Matt Godden replaces Joe Ward. Substitution, Southend United. Emile Acauah replaces Simon Cox. Attempt missed. Sam Hart (Southend United) left footed shot from outside the box is too high. Corner, Peterborough United. Conceded by Taylor Moore. Rob Kiernan (Southend United) wins a free kick in the attacking half.